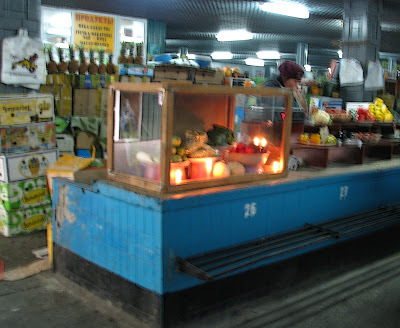 At the open air market place, some vendors keep candles in their vegetable cases to keep the cucumbers from freezing. That’s how cold it is. Imagine doing your marketing outdoors at minus 20F. We did visit a couple of modern malls, but couldn’t afford anything there. In fact it was at the Green Market, pictured above that we found the only bargain: pomegranates for 1/2 the price we pay at home. Shopping for spices out of bags on a table and not packaged with little hints on the side like “poultry seasoning” betrays our ignorance. In general, the food packaging was much more sparse (and sensible) than it is here. Milk was sold in vacuum sealed boxes that don’t require refrigeration until the seal is broken, or in plastic bags. The local convenient store did not have aisles of bags of chips and snacks, but had fresh buns on a tray, fresh potatoes and onions and an entire wall of vodka. Although there is a minimum drinking age, no one seems too concerned about enforcing it. I’m not sure how we got out of the market without taking pictures of the horse meat, but somehow we did. Meat just hung in large slabs, tongues and heads prominently displayed. Why not? It was freezing, nothing was about to spoil in a hurry. 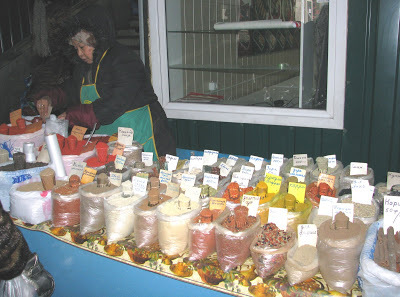 It would have been fun to sample some of the fare being sold in these pots; we had no idea what was in them. 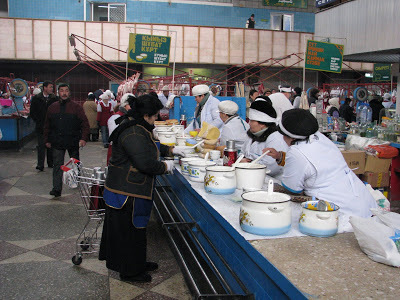 Dishes seemed to contain meat, but in small chunks, not the large slabs we demand here. Tonight Michael is going to attempt to cook a lamb/beef/noodle dish we sampled for lunch the last day there. We also went to a classic Kazakh restaurant and sampled camel and horse. I didn’t like the texture of the horsemeat, found it strong and stringy, but that could just have been my attitude reflected in my tastebuds. Some of the best food we had came out of the school cafeteria. Homemade mushroom soup, lasagna, home made apple pastries that really tasted like apples and not straight sugar. It is amazing what kinds of chicken nuggets dipped in cheezewhiz garbage we feed our kids at schools. We saw them pushing in a wheelbarrow sized basked of fresh veggies into the cafeteria to be converted into lunches — nothing pre-packaged. We could definitely learn from that lesson. So, mostly the US dollar did not go very far in the Kazakh market, but we did manage to score some beautiful felt products. 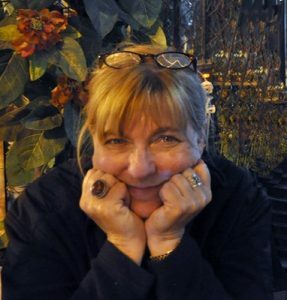 I think my favorite souvenir is a hand decorated necklace from Uzbekistan that one of the conference attendees was kind enough to hang around my neck. I’ve worn it every day since. While I was happy to get home to my local Heinens this AM, I wish I had had more of an opportunity to sample more of what those ladies had cooked up.